Converting a regular bicycle to be used as an indoor exercise station is relatively easy using an indoor cycling trainer. A cycling trainer is basically a stand that holds the rear wheel of the bicycle off the ground so it can turn freely. The tire of the rear wheel rests on a roller attached to a flywheel and fan or magnetic assembly that provides the necessary resistance. Most cycle trainers, once set up, allow you to remove your bicycle easily for outdoor riding and replace it--quickly and without further adjustment--when using your bike indoors. Remove the quick-release skewer from the back wheel of your bicycle by flipping the quick-release lever and unscrewing the assembly. Thread the quick-release cone back onto the skewer, and put the skewer in a safe place for future use. Replace the quick-release skewer with your cycling trainer skewer; unscrew the cone and thread the skewer through the axle. Thread the cone onto the skewer and close the quick-release lever to lock the wheel in place. Loosen the knob that positions the roller assembly and the knobs that control the cone grips on either side of the trainer. Position the bicycle wheel in the trainer and insert one of the cones on the quick release skewer into one of the cone grips on the cycling trainer. Turn the control knob for that cone grip clockwise and position the other quick release skewer cone into the cone grip on the other side of the trainer. Continue to turn the control knob until both cones are firmly in place in the cone grips. Examine the position of the tire on the roller assembly. Adjust the cone grip knobs to align the tire with the center of the roller. Lock the cone grip knobs in place. Turn the knob on the roller assembly to adjust the tension between the roller and the tire of the bicycle. For mountain bikes, it may be necessary to replace the rear tire with a slicker road tire to avoid excessive noise and an uncomfortable workout experience. 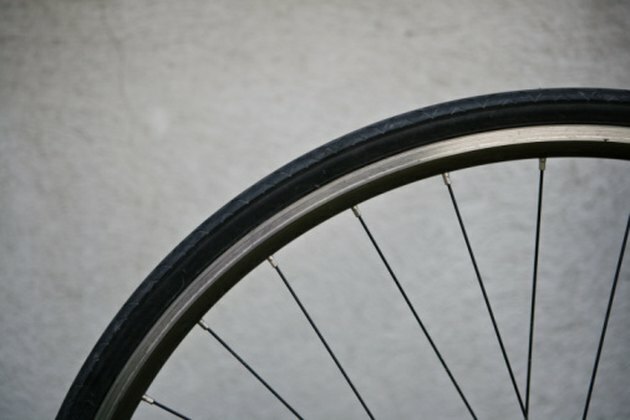 Cycling trainers raise the rear wheel of the bicycle between 4 and 6 inches, so you may want to place a secure block of some type under the front tire to level the bike.